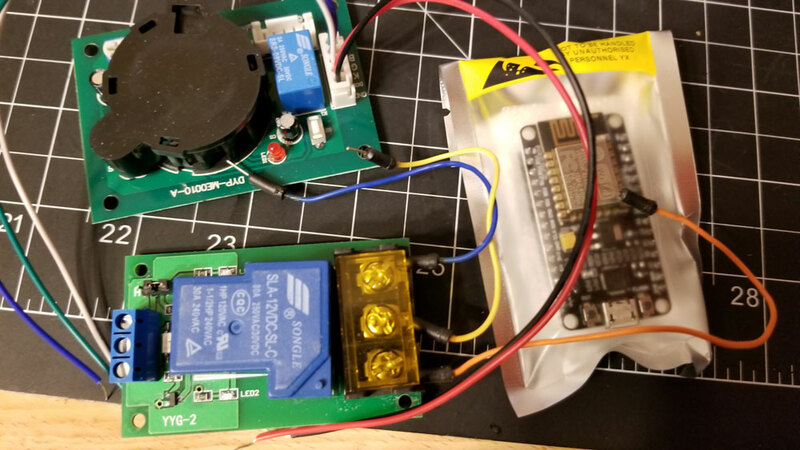 I am trying to build a smoke detector relay that will monitor a smoke sensor, temps, control an external 30A relay, and send me a text message if there is a problem. Additionally I want to be able to reset the 30A relay or shut it off remotely, and also view the temps and alarm states. Optionally I may add an input for a logic level signal to control the relay (via the NodeMCU) from an external device like a Rpi. L7805 5v regulator fed from the 9v regulator (found that 9v in may be too hot for the NodeMCU so adding this 5v reg). 3. send a text and email stating the alarm state with the timestamp, the last temperature sensor reading (use the last stored value) and state of mains power (from ADC0). 4. send a text and email every minute (or less) for 5 minutes with the same information. 5. allow a remote command to turn off the buzzer and toggle the 30A relay. 6. Poll an input for external signal (from RPi) to shut down or turn on the connected device via the 12V 30A external relay. 7. Send text or email once recovered from power loss with time stamp. 8. If either temp sensor is not readable - set a flag to note it is not available. 9. Watchdog timer to confirm normal operation. 10. Use a 9v battery for automatic backup power if mains goes down. 4. Disable the Piezo buzzer (it cannot be turned on remotely due to wiring config). 5. Enable or disable the signal to the 12V 30A relay (to switch on or off the printer). 6. reset the nodemcu (this may not be implemented except for a soft reset) since I don't want a reset of the MCU to bounce the relay. 5. Possible remote trigger logic level input (not sure on the connector type), would probably add an opto-isolator for this. I have the schematic almost done except for some odds and ends like the remote trigger input which I may or may not end up using. The next step is to build the program for the NodeMCU to manage the sensors and send the notifications. So this is gonna be a heavy lift for me since I have not messed with Arduino or any PIC for quite a long time, but I am gonna try breaking this down in baby steps and work the tutorials. I will hopefully get somewhere with it and learn some new tricks.